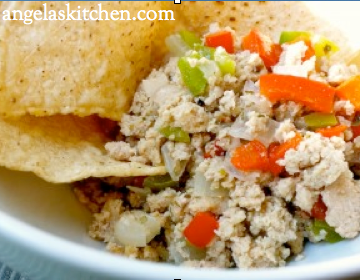 Ground Turkey Fajita Hash is super versatile. A quick and delicious lunch, an after school snack for hungry teenagers, or a quick dinner (just add a salad and a few corn chips or toss on a baked sweet potato or into taco shells). My family has really enjoyed coming up with different ways to use this recipe (nachos, baby!) How would you serve it? I was inspired by the recipe from Affairs Of Living, which I tweaked to my family’s taste and to make freezer friendly. Enjoy! Heat oil in a saute pan. Add onion and bell pepper and sauté until tender. Add turkey, herbs and spices to veggies. Breaking up turkey, cook until turkey is cooked through. Freezing Directions: Allow to cool. Divide turkey fajita hash into the designated number of lunch sized freezer containers indicated. Seal, label and freeze.